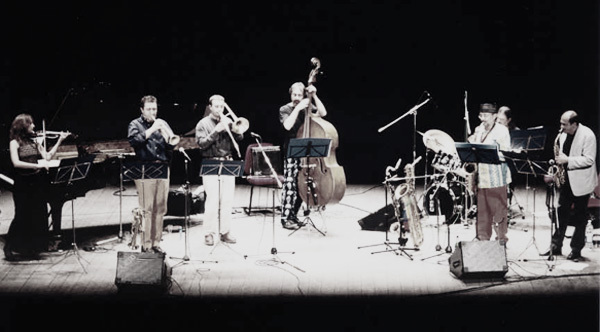 Born in ’86 as quintet, the band is actually a septet, with 4 CDs realized. “…some of the most innovative and assured group playing I’ve heard… a delight from start to finish.” (P. Donnelly, Ejazznewws).”This is a fizzing band, full of carnival colours and offbeat energies…: long pieces impressively written, developed and sustained…” (The Penguin Guide to Jazz…, U.K.). 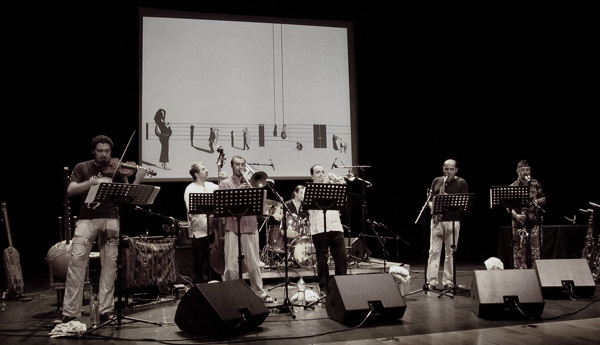 “Septet with a happy big band sound… loud, fun, accessible stuff, tuneful… lots of european touches too… (C. Matsumoto, Zookeeper online). “Fazio is one reason why, for this american listener, Italy has one of the world’s must consistently stimulating jazz scenes.” (K. Whitehead, Cadence, USA). “(this cd) is istantly on my best of the list not just for the year but the youthful decade. It has the seminal quality of… recordings that marked their own year and decade with individual imprint in your face.” (L. Van Trikt, Cadence, USA).